What happens when the Russian Orthodox tradition meets post-Soviet Russia? This is the gemeral question which will be in the focus in this study of the Orthodox discourse in post-Soviet Russian culture. It will be abalyzed both in its own right and as a constituent of memory, a conservative or imperialist political attitude and postmodernism. 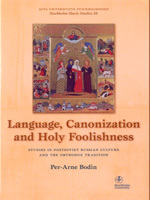 One issue addressed in the debate over the use of Church Slavonic as the liturgical language. Another invloves the nature of the canonizations that have taken place in the Orthodox Church in recent years and attempts to canonize the soldier Evgenij Rodionov and Stalin. A third topic is jurodstvo, or holy foolishness, for centuries a special and recurring theme in the Orthodox Church that has re-emerged after the fall of the Soviet Union. A chapter is devoted to Ksenija of Petersburg, a peculiar and much beloved holy fool of that city. A final issue concerns the signifigance of the Orthodox tradition in recent Russian art and poetry.